When I was a lad at school my English teacher defined for the class the meaning of 'dogmatic'. By way of illustration she intoned 'the dogmatic scientist'. I was silently outraged. Scientists are seekers after truth. 'The dogmatic English teacher' would be more apt! Sorry teacher. You were right. I was wrong. 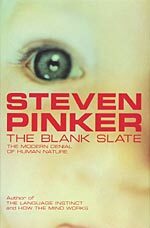 My disillusionment with scientists has been long in building, and is now complete due to Steven Pinker's new book: The Blank Slate: The Modern Denial of Human Nature. While it has destroyed the remaining illusions I had about scientists, it has offset this by affirming my belief in science. Not, I hasten to add, that science's current answers are necessarily right, but that science is a self-correcting system. The principle purpose of this book is to refute in popular discourse some assumptions about humanity that recent studies of the human mind have made obsolete. Those assumptions are: the Blank Slate, the Noble Savage and the Ghost in the Machine. The Blank Slate is the notion that out minds are infinitely malleable, especially as children. The concept of the Noble Savage is that the horrid aspects of life are due to that malleability being misemployed to pervert us, as compared to native persons who are not so twisted and thus live happy lives. The Ghost in the Machine is a pithy term for Cartesian dualism: that our minds are quite separate from the bodies which house them. Pinker comprehensively demolishes all three. He approaches the issue from the perspective of an evolutionary psychologist: the capabilities (including the mental capabilities) of people were evolved, as described by Darwinian models, in order to meet their survival and reproductive requirements. The evolutionary variation that distinguishes humanity as a species virtually all took place during the relatively lengthy period in which humans and their precursors lived as hunter-gatherer bands, not the mere ten millennia of settlement and large-scale social organisation. This means that we are not born with minds that are ready to absorb whatever culture cares to imprint, without limit, but are equipped with a wide range of mental mechanisms (or an impetus to develop those mechanisms during the first years of life) that proved useful for our hunter-gatherer lifestyle. Some of these mechanisms have been adapted for our more complex modern societies, but that does not detract from their importance. Pinker assembles a strong empirical case from the neurological sciences to prove his point, and ties this in with other scholarly fields, such as anthropology. In doing this he engages in the dangerous task of choosing: will he go with the mainstream social scientists, or those dissidents who are roundly condemned by their colleagues. He has chosen the latter, rightly recognising that much anthropology has been corrupted by a post-modern theoretical foundation that renders it useless. He draws on Napoleon Chagnon's studies of the South American Yanomamö tribes as a window into how humans related to each other before the development of more widely organised societies: in a word, appallingly. Rousseau was wrong. By our modern sensibilities, the savages were anything but noble. Along the way he takes on those scientists who oppose the concept of a human nature, highlighting the way some resorted to dreadful misquoting so that, for instance, geneticist Richard Lewontin and neuroscientist Steven Rose could mutate Richard Dawkin's '[genes] created us, body and mind' into '[genes] control us, body and mind'. Quite a difference. I suppose scientists can, indeed, be dogmatic. Pinker also defends the fact that our brains have a set of built-in modes of operation, and certain built-in limitations, from attacks by the religious and cultural right. This is not the end of the matter. He persuasively argues not only that that this 'mechanistic' view of humans does not justify any abdication of personal responsibility for uncivilised behaviour, but that it provides a stronger basis for morality than either Marxist atheism or any of the various faiths. The reason is that, for all practical purposes, it leaves our conception of free will undamaged. The mind, which forms our nature, may be mechanistic, as indeed may be the processes of Darwinian evolution which formed the mind, but it is also an 'open-ended combinatorial system' which yields infinite variety within the bounds of what it is to be human. This book is a powerful addition to the popular exposition of science. For me, it also provides a powerful underpinning to Hayek's The Fatal Conceit. Hayek assumes a human nature, and a state of nature in which humanity operated through most of its past. Pinker proves it.